LET’S SHOW THE WORLD WHAT THE HUNTING COMMUNITY IS DOING FOR HUMANITY. Anyone wanting to support these campaigns, please contact the members involved and show them “HUNTERS CARE”. TO SUPPORT IN YOUR AREA? 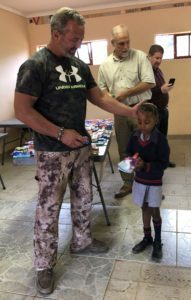 This humanitarian initiative is aimed at consolidating the existing social responsibility initiatives of all the members of PHASA under a single umbrella with a view to providing a fuller understanding and account of the professional hunting industry’s contribution to community development, food security and rural education. R100 000 a year towards humanitarian work. 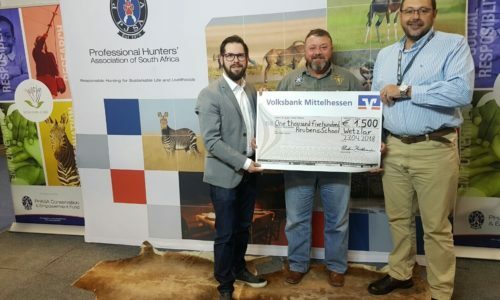 The total contribution of professional hunting to community upliftment in South Africa has therefore been significantly understated and PHASA’s ability to give a full assessment of the industry’s humanitarian impact had been hampered as a result of the diverse nature of its members’ contributions. In the wake of increasing criticism levelled at the hunting industry – taking place against a background of a general misunderstanding of what it does and how this benefits both conservation and empowerment – it is no longer feasible to talk about hunters’ humanitarian efforts in terms of Rands and cents alone. Anecdotal evidence no longer suffices when the hunting industry is asked to substantiate its claims of community engagement. All the schools, roads, clinics and crechés it builds, all the monetary donations it makes, all the jobs and dependants it supports, and all the carcasses it gives for food – all of these have to be measured so that the hunting industry can give the public a proper account of its positive impact on rural development. The food security that professional hunting provides, particularly in areas where livestock-reared meat is expensive and difficult to access, is key to countering the misperception that professional hunting is a wasteful activity. It is estimated that professional hunting produces around 2.6 million tonnes of meat every year, a significant proportion of which is donated to schools, orphanages, old age homes and villages. Local consumption hunting enjoys far greater support than its professional counterpart, despite the fact that both sustainably use their quarry. At the end of the day there is little difference between the two: a local hunter will keep the skull to hang above his bar and a professional hunter will take the meat for his own use, sell it or donate it to a charitable cause. It’s a misperception that needs to be addressed or the professional hunting industry risks losing its social licence. The beneficial spin-offs of hunting are evident to the communities living in wildlife hunting areas but less so to urban society. Unfortunately, public opinion is formed by city folk and unless the industry properly accounts for its humanitarian work it risks not only our profession but the livelihoods of those who depend on hunting. BOERE IN NOOD (BIN), ‘n NIE WINSGEWENDE ORGANISASIE, registrasienommer, 164-418, is in November 2015 gestig om boere wat gebuk gaan onder droogte en ander natuurrampe, by te staan. Is ŉ geregistreerde kleuterskool en liefdadigheidsorganisasie, geleë in die weste van Pretoria. Die kleuterskool fokus op drie- tot vyfjarige behoeftige kleuters, wie se ouers nie skoolgeld kan bekostig nie. Ons kleuters is baie ver agter met hul ontwikkeling, met o.a. taal, motoriese ontwikkeling en emosionele ontwikkeling. Die skool verleen hulp om hierdie agtergeblewe kleuters skoolgereed te kry. Die doel van die Eljada Huis is om vanuit ons Gereformeerde geloofsoortuiging ‘n verskil te maak in die lewens van mense wat minder bevoorreg is. Die Eljada Huis is ‘n inisiatief van die Gereformeerde Kerke in Pretoria. Two days of devastating fires along the Garden Route left nearly 10 000 evacuated, and a staggering loss of 300 homes. The Fund donated over R 250,000 of clothing, food, water and other supplies collected from our faithful sponsors towards this cause. 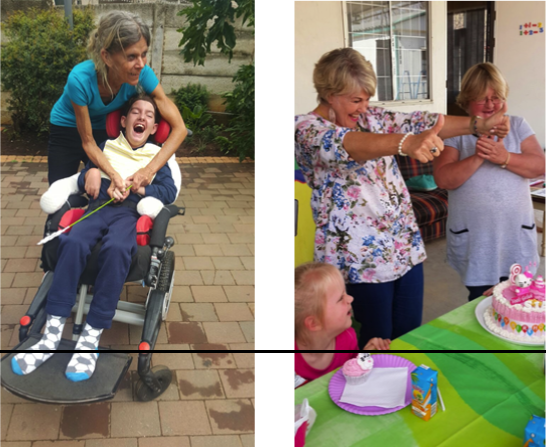 Our learning centre is a non-profitable organization that empowers children living with severe disabilities, to reach their utmost capabilities and be accepted into society in whatever way possible so that they too can live a meaningful life. We started the centre two years ago with the help of the community on a piece of land that was given to us by the Meerhof School, a government based school for physically disabled children. Are a community-based (CBO), non-profit organisation (NPO). We provide a residential facility caring for children and youth. We provide support for boys and youth from 12 to 18 years of age ensuring that they have shelter, clothing, 3 meals a day and that their basic needs are met. We also run a creche facility where pre-school children are given 2 meals a day. We run TB, HIV and AIDS awareness workshops and we provide social work services and find skills development and job creation opportunities for people with disabilities, unemployed women and youth. We partner with a number of projects and organisations to provide support. These include the Paul Jungnickel Home for over 140 adult persons with disabilities; a vocational therapy unit or protective workshop for people with disabilities. Is a primary school in Pretoria which gives every scholar the best academic, sport and cultural opportunities. Both English and Afrikaans scholars receive the same amount of attention. 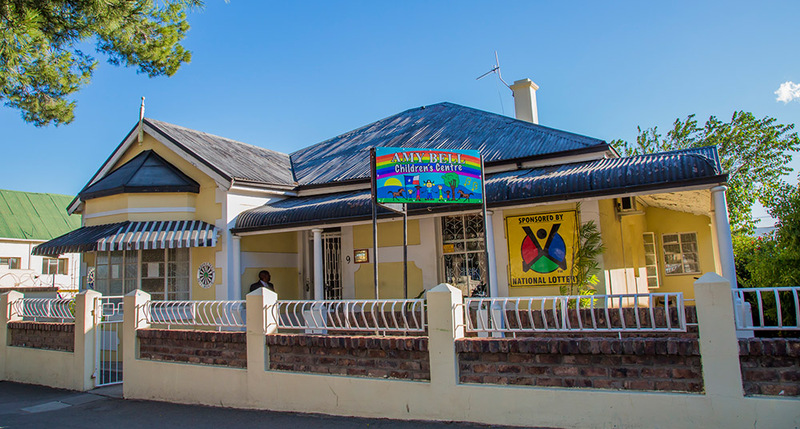 Laerskool Kameeldrift have about 435 learners and they all receive the best education. For Autistic and Mentally Challenged young adults. This is an amazing project where these people are all taught different skills according to their abilities. They do pottery, bake dog biscuits, precooked frozen vegetables and make the most beautiful birthday and Christmas gifts. Child Welfare Tshwane is a registered, non-profit child protection organisation that has been caring for, protecting and empowering vulnerable children in Tshwane since 1918. Weskoppies Hospital is a specialized psychiatric hospital situated in the western side of Tshwane, serving the greater Tshwane, Metsweding, Mpumalanga Province, Tembisa hospital and forensic patients of North West Province as well as Mpumalanga. The hospital has 1067 approved beds with 715 beds operational. The hospital has been in existence for more than 123 years. Although most of these projects are not officially sanctioned PHASA Fund projects, the Fund appreciates the social responsibility efforts of our members and always willing to support where we can. Members requiring any support and non-members willing to support our member’s regional campaigns, please contact our marketing department for more information or the member involved. Humanitarian Services to people and communities worldwide is a major objective of the SCI Foundation. In 2015 the Bell family joined with the SCI Foundation in support of their Humanitarian Services program by making a major funding commitment to what is now known as the Bell Family Blue Bag – “Pay It Forward” initiative. It is the goal of this program to make a difference in the lives of those less fortunate throughout the world. After the Boer War and the flu of 1918 many children were left orphaned. As a result of the draught in 1933 parents could no longer take care of their children. No more children could thus be accommodated at Abraham Kriel Langlaagte. 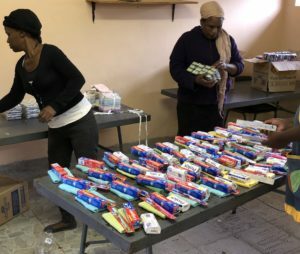 The Church Board of the Dutch Reformed Church in Nylstroom (Modimolle) saw the opportunity to help children in need. The municipality decided to donate 20 ha of ground for the erection of a children’s home in Nylstroom (Modimolle). Building started in 1958 and the first children moved in in 1959. Supported by numerous members. Ten boys from the Abraham Kriel Children’s home in Modimole visited Motsomi Safaris during April. They were trained in rifle safety and practiced rifle shooting at the shooting range as well as shot placement on different animals. Everyone got to know each other around the campfire and on the first morning, geared with drinks and snacks, they went hunting with their “DADS”. 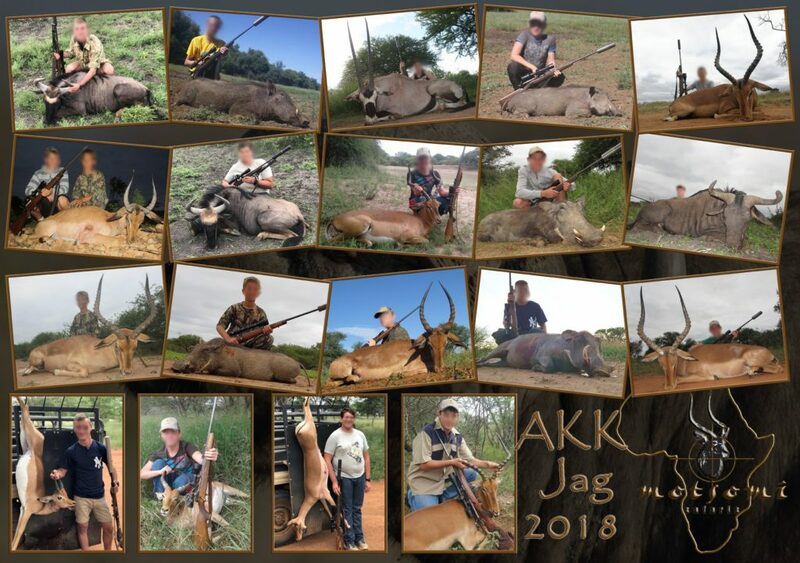 Pieter, Zane, Willem, Michael, Donnevan, Boeta, Brandon, Derrick, Willie and Bradley did an excellent job hunting the animals available. The next day everyone helped to process the meat which was donated to the children’s home. 1 Ton of meat to the value of R35 000-00 was sent back with the kids. Hannes Pienaar; Hannes Berg; Marco Schoonwinkel (PH Motsomi Safaris); PC Potgieter (PH Motsomi Safaris); Lammert Kruger (Purple Rain – Madikwe); Pieter van Deventer, Pieter Nel & Christiaan; Antonie Lotter (PH & Swift Dip); Jacques Monro (Madikwe); Maruis van Aarde; Tony de Bruyn (HO Wild Wildebeest Safaris). 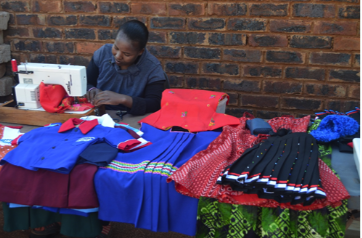 Christinah Ndlovu heads up a team of unemployed women, teaching them sewing skills in order to create jobs and produce articles of clothing for sale. This money is not only shared amongst the group but also used to feed many needy township children. Under the kind mentorship of Robin Du Plessis this skills base is being broadened to include other homemade products for resale. Their wish is to build an enclosed sewing room as a shelter from the elements, instead of having to work outdoors. It all started some years ago with the support and development funding financed by Safari Club International (SCI). I am always amazed at the at all the people, organisations and political parties that come out of the woodwork to take credit when a vision comes to realisation and the unsung heroes are overlooked. The central figure and driving force behind this particular project was Inkosi (Chief) Daniel Hlabisa of the Mpembeni Community, near the small town of Hlabisa in KwaZulu-Natal, who had the vision to establish an ecotourism enterprise. The 750ha (1,850 acres) of land set aside by the community consisted mainly of abandoned agricultural lands and three koppies adjoining the original Hluhluwe Game Reserve (HGR) at the time administrated by the then Natal Parks Board (NPB). The Natal Parks Board had their own vision of creating buffer reserves around HGR on the surrounding community the land adjoining the Park. This initiative was headed up by Paula Morrison and Ernest Tshabalala. The idea was to encourage the communities in the region to become involved in the business opportunities that ecotourism offered and at the same time improving the public relations between the reserve and its neighbours. Nic raised the money from Safari Club to game fence the property to the specification as required by the State Veterinary Department to allow for the introduction of buffalo to the property. This was very important as the founder population of game introduced to the newly fenced reserve would include a number of buffalo. These animal populations would need to establish themselves and the trophy animals would be hunted to service the reserves running costs. Any profits would be used to develop the reserve. The reserve was financially self-sustaining but it was always the intention to build a lodge in the second phase of this development. However, it soon became apparent that as a stand-alone project, a property of this size could not sustain itself as there were just not enough trophy animals that could be harvested to follow through with Inkosi’s dream, of the community owning their own lodge. Nic got the Umbono Foundation involved. This was a foundation established by Pastor Terence Rose and Nic Vaughan-Jones. Umbono is a charitable organisation to aid and assist rural communities in Africa. This partnership with the church was a major turning point and through their efforts we gained the trust and support of the community at large. Another factor was the influence that the late Albert Ngcobo had on the project. He worked tirelessly changing people’s opinions on the advantages of having such a reserve with an ecotourism lodge. There were many hurdles and sceptics to be overcome. Unfortunately, he passed away before the lodge was built and would never see the completion of the project. There are not many community people who are (were) prepared to voluntarily work on a project for the benefit of their fellow citizens. The Umbono Foundation built a clinic and a crèche for the community under the auspice of the MCCGR project. Soon after this, Nic moved to southern Mozambique to continue the work of this Foundation. Up to this point, I had undertaken all the marketing and trophy hunting conducted at the reserve and we had built up a little nest egg but did not have anywhere near enough money to build a lodge. The responsibility was now mine to oversee the project. So, we continued without a lodge and this made marketing hunts at the reserve very difficult. Hunters used accommodation near Hluhluwe or at St. Lucia town when hunting in the reserve. This meant we had to drive for an hour to get to the reserve before we could hunt, not ideal, making the marketing of these hunts very difficult and off putting to many potential clients. My management input was also limited as I lived four hours from the reserve and I also noticed that the game numbers were starting to dwindle and trophy animals becoming few and far between. Was this the start of the end? Unbeknown to me, Inkosi had asked the local section manager from HGR to shoot him a few animals for a ceremony. By this time the Natal Parks Board had been replaced by Ezemvelo KwaZulu-Natal Wildlife. This provincial conservation body now administered the Park and had their fair share of problems. One of them being the section ranger in question, who was dismissed by the organisation. We were never given the reasons for his dismissal but still very suspicious that he was running a bush meat business at the local market. Many of these animals being poached at Mpembeni. His demise came after eight Rhinos were found poached in one incident in his section of Hluhluwe Game Reserve. We can only speculate if he was involved or not. However, after his dismissal there was a definite increase in the game numbers at the MCCGR. Buffalo, leopard, giraffe, zebra, nyala, kudu, wildebeest and impala were hunted in order to achieve our goals and pay the bills. Nobody showed any interest in helping us to develop the reserve. Many of the well-known non hunting private reserves established in South Africa initially started off as hunting areas and through the process of evolution changed their emphasis to non-consumptive ecotourism usage. What were our options? Enter Wellman Khumalo, a local politician based in the area. At the time he was a school deputy principal at Mpembeni. 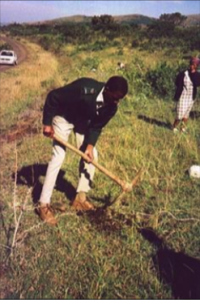 Being young and having great aspirations to become a successful politician he took up the cause with the government, community and KZN Wildlife. Seen as a local mover and shaker, he made it happen albeit in African time. I recommended to the Mpembeni Tribal Authority and reserve steering committee that we re-approach them to see if they might be interested in building a lodge. They dually accepted the challenge and it has without doubt been a mighty challenge. They sourced the majority of the R25 million funding for the lodge from the National Empowerment Fund and also spent a large chunk of their own development capital. Khumalo kept up the heat from his side and I worked alongside him smoothing the way for things to materialise. I will not bore you any further with the details but all sorts of people and department now became involved and all taking credit for this project being launched. I would like to thank all those who genuinely made an effort to contribute to the success of this project. Today, Rhino Ridge Safari Lodge is operated and managed by Isibindi Africa (Brett Gehren, from Dundee), a tourism company with a successful record of working with rural communities. Khumalo continues to play a role in the project while following his political career. I became Chairman of the Professional Hunters Association of South Africa Empowerment and Conservation Fund in 2014 a year in which the fund experienced it most successful fund raising gala dinner ever, raising R 2.4 million. During my term in office, we initiated a program called the “Hunter’s Care Programme” and there can be little doubt that my contribution to conservation is but a drop in the ocean of what my Professional Hunting colleagues have achieved over the years and will do in the years to come. The Fund is registered as a Non-Profit Company and a Public Benefit Organisation, which means that bona fide donations, whether it be a company or an individual, will be entitled to an 18A tax deductible certificate.